Spaghetti squash is a great thing to have on hand when you are craving carbs during different phases of the Dukan Diet. Not only does it resemble pasta, it also takes on the flavor of all of your favorite pasta sauce. However roasting spaghetti squash can take over an hour, so this little trick will help you microwave squash in just about 10 minutes. 1. Pierce the squash like you are cooking a potato and then place the whole thing in the microwave for 10 minutes. It should be soft when you take it out. 2. In a saute pan over medium heat, warm the olive oil. Spray with cooking spray and add the onions and garlic. Cook for five minutes or until it becomes fragrant and begins to soften. Stir in the spinach and cook for 2 minutes more. 3. Add the sausage and cook for about 5 minutes, breaking it up as it cooks, until cooked through and slightly browned. 4. Add the sriracha and soy sauce and stir together. Let hang out and simmer for 2 minutes. 5. 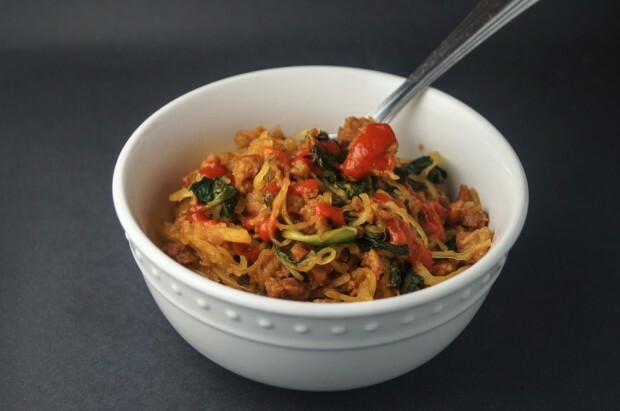 Stir in the spaghetti squash and serve.